Pop culture has a way of taking over some potent concepts and then diluting and trivializing them. It happened to the yoga tradition as a whole, and it happens to many aspects of the yoga tradition, such as bandhas, vayus, chakras, and so on. Nobody does it maliciously or on purpose, we just often lack understanding or proper context to grasp the depth of those concepts. When a concept goes mainstream, the focus is shifted from internal to external, to something you can buy, acquire or show off. Just put “chakra” into the search field on Pinterest and you will get a variety of products that promise to “balance out your chakras”: crystals to hang, stones to wear, potions to rub on, and so on. And while you are busy hanging, wearing and rubbing, you might forget that first and foremost balancing the chakras involves turning within. For the ancient yogis chakras were potent energy centers along the main energetic channel of the body (sushumna nadi). This is where the secondary energetic channels (ida and pingala) are said to cross. The intersection of all three major channels creates energy concentrations that affect our functioning. When the energy is flowing freely, the chakra wheels are said to be spinning smoothly much like water wheels under the smooth flow of water. When the energy becomes clogged, the functioning of the chakras is affected and all sorts of problems sprout in the affected area. Whether or not you believe in the spinning chakras, they do point to the areas of the body that carry certain meaning. Is anybody surprised that the heart chakra is associated with love and connection? Or that a chakra that represents creativity and sexual energy is located near the reproductive organs? So the locations of the chakras make sense. The chakras are not literal entities that sit in our bodies next to our organs, but they do reflect specific concentrations of energy that is present in the body in certain areas. For example, if you have trouble expressing yourself, you might stutter, or have trouble controlling your voice, which is an area of the throat chakra. It is not an accident that we talk about “finding one’s voice” when we are successful at expressing ourselves, or “get choked up” when we have hard time doing that. What you say and how you say it is how you present yourself to the world. I like to think of chakras as clusters of beliefs around specific needs we all have. We all need to be loved, but each one of us has a wide variety of beliefs about what it looks like, how it feels, whose responsibility it is and so on. When those beliefs get us what we need (love and affection), then those beliefs are effective. But if we keep struggling with the same issue over and over, then something in that cluster of beliefs is sabotaging our best efforts. And if we want to get those needs met, then we need to reevaluate those beliefs. Chakra work allows us to do that. It serves as a map to help us figure out where we are on the spectrum between function and dysfunction on the level of each need. Chakra work is meant to anchor your attention in a specific body area and use it as a focusing device to work out the issues that you are dealing with on the level of each chakra. Over hundreds of years that the chakra model has been around, all kinds of symbols became associated with chakras. Each chakra is represented by a shape, element, color, sense, sound, deity, animal, certain kind of lotus, and so on, and so forth. It’s easy to get lost in all this symbolism and forget that those symbols are meant to represent certain qualities and serve as focusing devices. There is a reason, for example, that the root chakra is connected to the sense of smell. The root chakra is associated with survival, meeting our basic needs and is connected to instinct. So is smell. Animals use the sense of smell to identify danger and to find food. When something “smells fishy” it means that we cannot instinctively trust it. So all those symbols are meant to lead us back to the clusters of belief that we have tangled up around our specific needs. Any issue that you are dealing with right now can be traced back to one of those needs, and your beliefs around those needs can be unearthed using symbols as focusing devices. 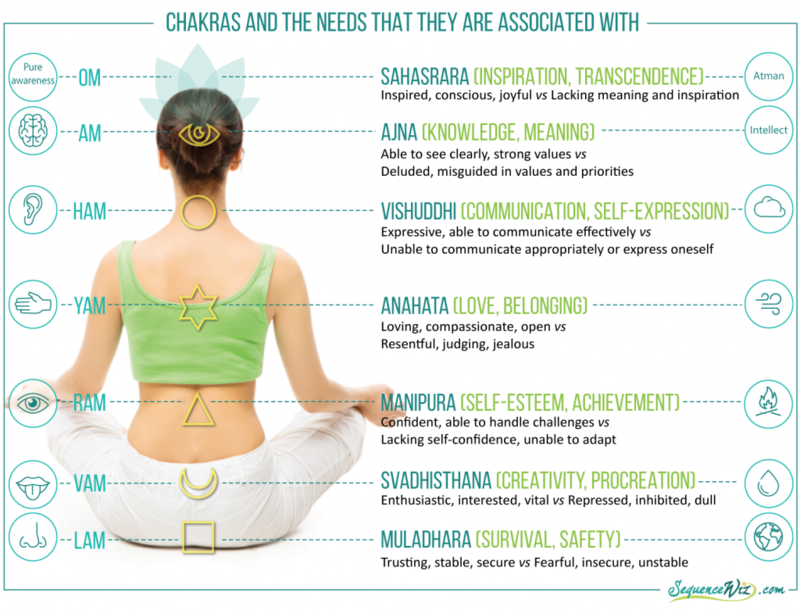 Here is a quick overview of the main chakras and the needs that they are associated with, along with the spectrum of function and dysfunction at each level. Next week we will dive into strategies for working with chakras. Tune in! Some of your posts arrive in my inbox on JUST the right day. Timing of this one couldn’t be better. Thank you again for all of your hard work and generosity in sharing information. Previous story Do your beliefs hold you back or propel you forward?